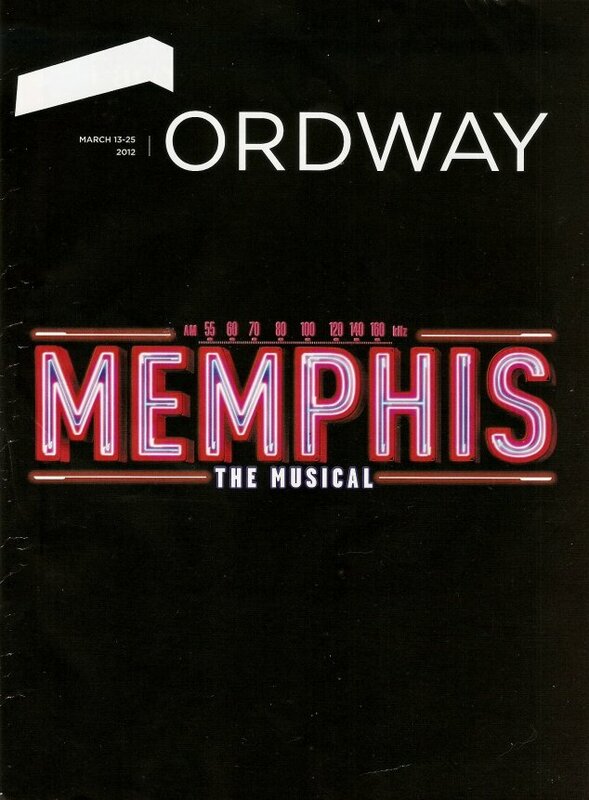 I saw the first national tour of the musical Memphis last night, and I loved it more than I expected to. It won the Tony Award for best musical in 2010, so I knew it would be good. But I had several opportunities to see it on Broadway, and just never did. Something else always ranked above it. So it's not a show that I've been dying to see, but I'm grateful that this tour gave me the opportunity to catch this fantastic, new, original musical (something that's becoming quite rare on Broadway these days). 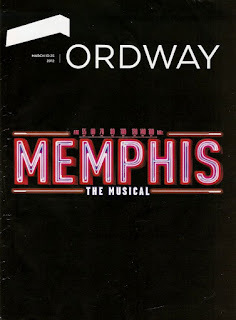 Memphis is still playing on Broadway, with Adam Pascal (who originated the role of Roger in RENT), taking over the lead. If I didn't have a half dozen new shows I wanted to see, I might go see it again on Broadway! Memphis is about the birth of Rock and Roll. It's loosely based on the life of pioneering DJ Dewey Phillips, a precursor to the "father of Rock and Roll," Alan Freed. Both men were instrumental in desegregating the airwaves, playing so-called "race music" by African American musicians on mainstream (aka white) radio stations. In this fictionalized account, our DJ is Huey Calhoun - a poor "redneck" who lives with his mother and can't hold down a job. Until he convinces a radio station to give him a temporary job spinning records. People fall in love with the music he plays and he becomes the most popular DJ in Memphis, even hosting his own television show. He becomes friendly with many of the African American musicians and helps to launch the career of the lovely and talented Felicia. They fall in love, a dangerous prospect in Memphis in the 1950s. Felicia eventually realizes that she has to get out of Memphis to have the life and career she wants; her color limits her chances and choices in the South. But Huey can't leave Memphis, that's where his life and his soul will always be. The world and Felicia move on without him, but they don't forget him. This is a great ensemble show, but the stars of the show are its two leads, both of whom are spectacular. Felicia Boswell plays Felicia (appropriately enough), and was previously seen in the Twin Cities in the Guthrie's production of Caroline, or Change in 2009. She's a true star, with an amazingly powerful voice over which she has incredible control. She knows when to pull it back for a quiet moment, and when to let it go. Bryan Fenkart as Huey is incredibly charismatic and energetic, and makes you feel every emotion along with Huey. He's a loveable goofball whom the audience can't help rooting for. The two of them have great chemistry and their voices blend beautifully. Huey and Felicia are an unlikely couple, not just because of their race, but their love is real and obvious to everyone watching. Other standouts in the cast include Will Mann as Bobby, who reluctantly moves out of his comfortable position as janitor at the radio station to shine in the spotlight on the TV show. Last but not least, Julie Johnson is fabulous as Huey's mother, who transforms from a tired and worn out waitress to a fashionable lady, with a standout moment in the song "Change Don't Come Easy." The choreography is fast and tight, reminiscent of the '50s but with a modern edge. And the ensemble performs it with much energy and life. The costumes are great, from Huey's slouchy mismatched outfits, to Felicia's gorgeous dresses (especially the strapless green number in the second act). The set looks simple but has complicated pieces that move in and out, at times letting us catch a glimpse of the fabulous band at the back of the stage. Memphis finishes out its two-week run in St. Paul this weekend and is definitely worth checking out. I think it's one of the better touring shows to come to the Twin Cities this season, if not the best. Next up at the Ordway is The Addams Family (I'm going to pass on that one), followed by the amazing musical FELA!, based on the life of Nigerian musician and activist Fela Kuti. I saw it on Broadway and can't wait to see it again; the choreography is like nothing I've ever seen on a Broadway stage. Looking ahead, the show that I'm most excited about in the Ordway's recently announced upcoming season is the Broadway Songbook series. Other than that there are a couple great shows that I've seen before (Chicago, Billy Elliot, Anything Goes - although this is the new Broadway revival production that I've been wanting to see). And then there's Elf, which they call "an original musical." Since it's based on a movie I don't consider it an original musical, unless they mean that it's an Ordway original production. In which case I will see it; the Ordway always does a great job with their original productions and hires some amazing local talent. But enough about next year, go see Memphis while you still can. Hockadoo!